We, Mehak Handloom Industries, established in the year 1986, are one of the leading manufacturers, suppliers and exporters of a wide range of optimum quality Blankets and Bed Sheets. Offered blanket and bed sheet range is inclusive of Railway Blankets, Relief Aid Blankets and Army Blankets. These blanket and bed sheets are manufactured from high quality fabric yarns that are procured from trusted and reliable vendors of the industry. 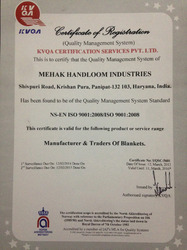 The offered blankets and bed sheets are manufactured using advanced weaving machinery as per the latest market trends. These blankets and bed sheets are known for their eye-catching appearance, attractive pattern, alluring design, colorfastness and resistance to shrinkage. Available with us at industry leading prices, these blankets and bed sheets offered by us are highly appreciated among our customers. Since the commencement of our company, we have been backed and well-supported by a team of skilled and diligent professionals. They are trained at regular intervals of time through workshops and seminars. This training helps our employees in enhancing their technical skills in the most efficient manner. By working in close coordination with each other, our employees avoid any kind hassle in the workplace. Established by our mentor Mr. Rajneesh Baweja, we have been able to gain huge clientele across the world. Some of our exporting countries are South Africa, USA and Europe. Keeping in mind the budget constraint of our customers, we offer them multiple modes of payments such as cash, online and credit card. Manufacturing, Trading, Importer and Exporter of blankets, blazer fabric, bed cover, blazer cloths and bed sheets. With our advanced infrastructure, we are able to manage quick and effective production. We have modern equipment and machineries to meet the client orders within the given time period. Our team of experienced professionals has vast knowledge of their respective fields and can perform any kind of task given to them. We have the ability to produce high quality products as per the clients’ requirements with our highly sophisticated manufacturing facility. We have facility of packing clips, yarns and blanket using hydraulic bale. In addition, we have advanced quality testing laboratories to conduct stringent quality tests to ensure high durability and cost effectiveness. We are proud to have an endless list of satisfied clients, who are doing business with us since the time of our inception. Our steady clientele defines our efficient work. We also maintain proper communication with our clients to offer them with the shipments as per their specifications and at preferred destination. With the innovative ideas and creative designs of our talented and professional designers, we are able to successfully create a huge clientele base across the world. Their imaginative ideas are reflected in the designs of our exclusive product range that have become very popular in the national and global markets. There are incalculable reasons to choose from our exclusive range of blankets across the globe. Following are some of the reasons why we are ahead of our competitors which there are unlimited reasons to select from our exclusive range of products throughout the world.